There’s a reason people genuinely feel that "Everything comes together here". 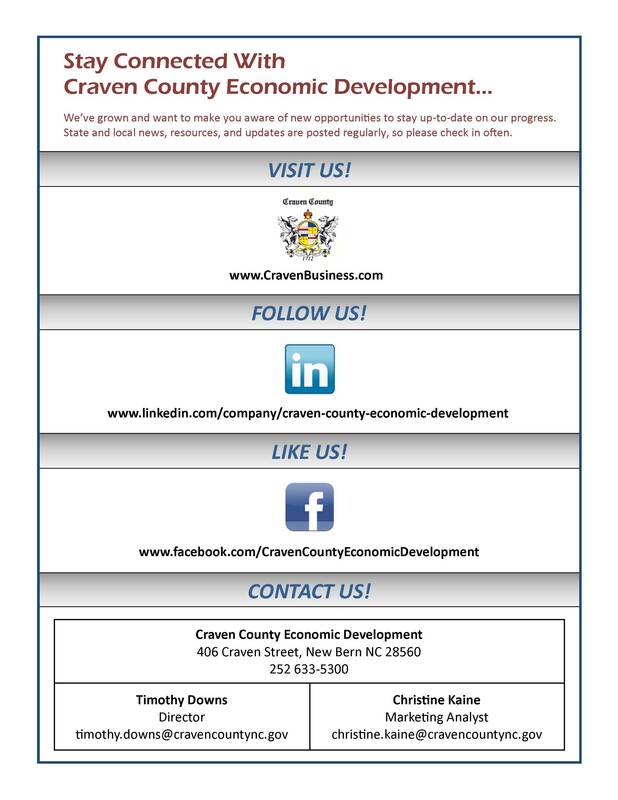 The city of New Bern and Craven County simply offer the best of everything for existing and prospective businesses. With small town charm and big city cultural and convention events, this is a great place to call home or hold your next convention or meeting. Corporate events and functions can be well-accommodated due a wide selection of hotels, restaurants, entertainment options and outdoor activities. From rail, air and water transportation options, the area garners the presence of large organizations such as BSH Home Appliances, Moen, Hatteras Yachts, and the Marine Corps Air Station (MCAS) base located just minutes away in Havelock, which contributes over 2 billion dollars to the local economy. On top of that, we also boast one of the best private and public school networks in North Carolina, world class health care facilities and access to the most talented and well educated employees in the world. Find out why New Bern, Craven County's prized community, is the place to launch, relocate or expand your business. From the moment you arrive, you'll see that our community is alive and thriving with lots to do! Swiss Bear Downtown Development Corporation coordinates the downtown revitalization effort providing information/data on marketing, business recruitment, long-range plans, and projects. The nonprofit organization also produces MUM FEST, a major festival held the second full weekend in October. For more information on MUM FEST, visit www.mumfest.com. Swiss Bear may be reached at (252) 638-5781.